When you’re in need of incense for comfort, energy clearing, meditation or ritual do you ever think about what’s in it or how it’s made? 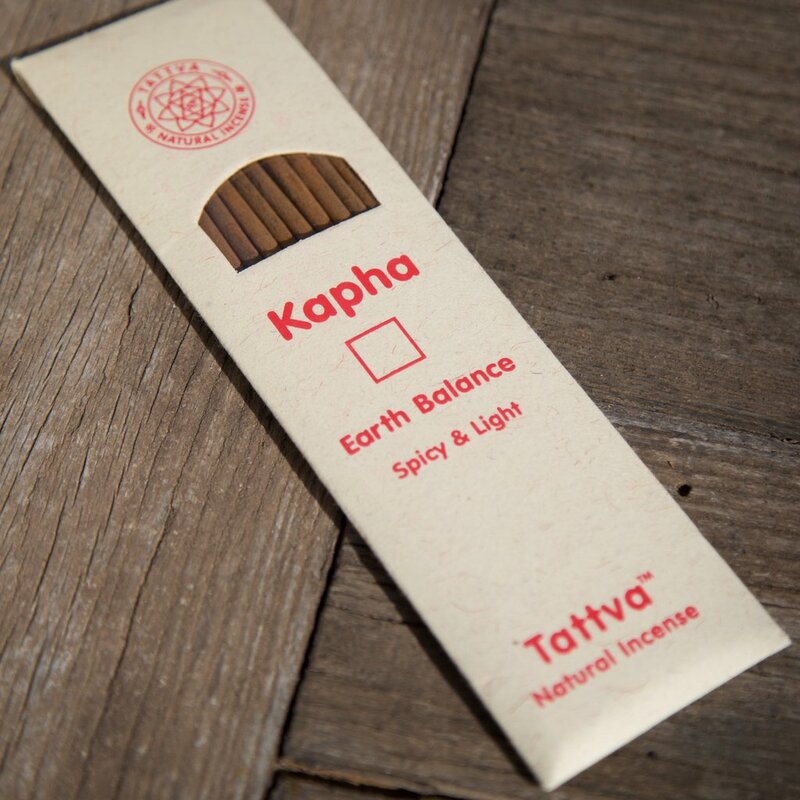 Or do you reach for the nearest Nag Champa package because you don’t know what to try? There’s a lot more to burning incense than lighting the stick and walking away. Learn the difference between synthetic and natural, how it affects your health and what the best incense companies are. The most important thing to consider when buying incense is whether it uses synthetic fragrance or not. In other words, fragrance is made with either a mix of natural and synthetic materials or is made entirely synthetic materials. Breathing in smoke from synthetic materials over long periods of time can be bad for your health. Personally, I get headaches! Don’t be fooled by the strong pretty scents of synthetic materials. Breathing in smoke from synthetic chemicals is not good for your health. Now with that being said, breathing in a lot of smoke all the time isn’t good for your health either. If you love incense, stick with the natural or low smoke brands and burn them in moderation. Indian incense is by far the strongest scented on market. I like to compare incense as you would with a culture’s food: spicy, bold, flavorful and strong. Most people hunting for incense settle with Nag Champa, as it is the most well-known incense from its familiar packaging and sandalwood scent. But I encourage you to look deeper. There are so many options and companies that are making efforts to support a good cause. Going with the food metaphor, Japanese incense is more subtle, artsy, elegant, soft and exquisite. Depending on the company, you still might find fragrant incense, but most Japanese companies use natural ingredients. Japanese culture naturally expresses everything as a beautiful art form and their incense definitely speaks to this. Tibetan and Butanese Incense, similar to Japanese incense, has no bamboo stick. They call it “doop style”. Tibetan incense is typically made with a lot of different herbs and a bit of spices. Real Tibetan incense has no added fragrance, which makes it difficult to know what it smells like in the packaging. In my experience it has an earthy smell. If you smell a perfume fragrance, it might not be traditional and most likely contains synthetic ingredients unless otherwise noted. developed in a lab and artificial scents were born. Luckily, as the health, organic and yoga trends arose, more natural/organic incense options made with pure essential oils became available. With the rise in popularity of burning sage and palo santo in our homes again, it looks like America is coming back to its native roots. How do I avoid synthetic fragrance? The best way to avoid synthetic scents is to do research on a company before purchasing their products. Sometimes, your nose will also help you out. I have a sensitive sense of smell and my nostrils will flare and sting when a scent is too powerful. When anything is extremely strong or fragrant, it most likely has synthetic fragrance. Natural incense is typically soft and subtle. Be careful of the companies that label their fragrance as “all natural” or say they “come from essential oils”. If it smells like a perfume bottle, it’s not natural. Learn the difference between what is actually natural and train your nose to what essential oils should smell like. The less ingredients the better! Be careful in your search. It’s hard to say exactly which companies out there are using natural ingredients and practices. But the sad truth is, a lot of companies in India use synthetic fragrance because of high demand and mass production. Instead of telling you all the companies that use synthetic materials, I'd rather tell you which companies use the best ingredients. What natural incense is recommended? Dried herbs, woods and resins: Resin is the purest form of incense—dried sap and solidified oils from plants and trees, chunks of wood or herbs and grasses. Be careful not to buy beaded fragrance resin! Companies can be sneaky! A good example of true resin is frankincense, copal, white sage bundle, cedar wood, sweet grass and palo santo. If you lean towards resin burning you may need a charcoal. I call it “old school incense burning”. Light a small charcoal, place it in a bowl, and sprinkle bits of herbs or frankincense “beads” on top to burn. Note: Most charcoal on the market is also terrible for breathing indoors. Regular charcoal usually has chemicals inside to make it light instantly. It produces black sooty smoke and isn’t recommended for indoor burning. Fortunately, there are alternatives such as coconut husk charcoal and Himalayan herb coals. They are available at East West Bookshop by a company called Higher Mind Incense, also listed below. 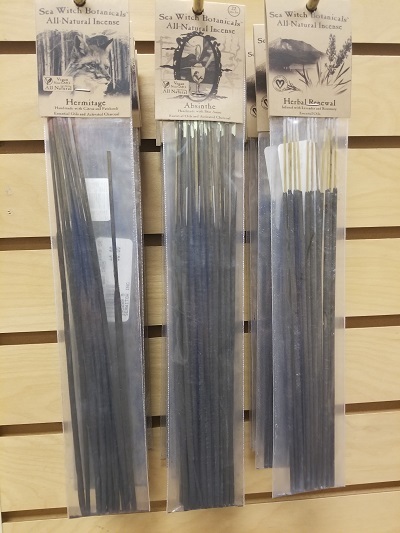 For people who want to ditch the charcoal and loose herbs, resin incense sticks exist too. The best and pure brands we carry are from Fluorescent Ranch and Mountain Naturals. We always have a lot of Palo Santo, White Sage, and other smudging materials in stock for you to try. Pure Essential Oil Incense: I have two favorites. Sea Witch Botanicals is made with only activated charcoal, the bamboo stick, and essential oils. It’s also low smoke! Perfect for those sensitive or allergic to incense. This company also sells bath and body products and candles. Higher Mind Incense is a cone and resin only incense company but their incense is also just as pure and fantastic smelling. They have a Pacific NW vibe and make a Northwest blend that smells just like a fresh hike in the woods! The bonus factor is they infuse all their incense with crystal gem energy, so it gives you an energetic healing boost as well. This is also the company that makes the chemical free all natural charcoal made from coconut husks. Japanese Incense: Shoyeido tops the charts as one of the best incense brands you can buy and the most natural out of all Japanese incense lines. The only ingredients are wood, herbs and spices! There’s not even a bamboo stick! The incense powder is pressed into a stick shape so that when it burns, you’re only smelling the incense and not the bamboo stick mixed in. They make many blends and scents. The scent notes are warm, elegant and soft. Because Shoyeido incense is pure and natural, it doesn’ give off a lot of scent from the packaging and some customers are turned off by this without knowing how amazing this brand is. Their scents will be revealed in the burning if your nose is not sensitive enough to discover it when it’s in the package. All the small packs come with a biodegradable incense holder too! Shoyeido also sells resin packages of a mix of woods and herbs for charcoal burning. There are trial packs for the sticks if you are undecided on a scent. Indian Incense: Tattva Incense is handmade and handrolled in Rishikesh India and contains no toxic or synthetic substances. They have an Ayurvedic line for Vata, Pitta, Kapha and Tri Dosha—I highly recommend them! Mother India Incense is also all natural and hand rolled. Each incense package is a different blend of Nag Champa (aka sandalwood) with floral scents and other herbs. Auromere has multiple lines of natural incense, including an Ayurvedic line and Aromatherapy line. The best part about their company is that 25% of profits go to support Integral Education in rural India. Side note on Ayurvedic incense: they contain many medicinal herbs that are uplifting and therapeutic. To learn more about Ayurvedic Incense, see my blog Ayurvedic Incense for Balancing Your Inner Elements. Tibetan Incense: Like I mentioned earlier in the article, most Tibetan incense is pure and natural because it is comprised of mostly herbs—a lot of herbs. 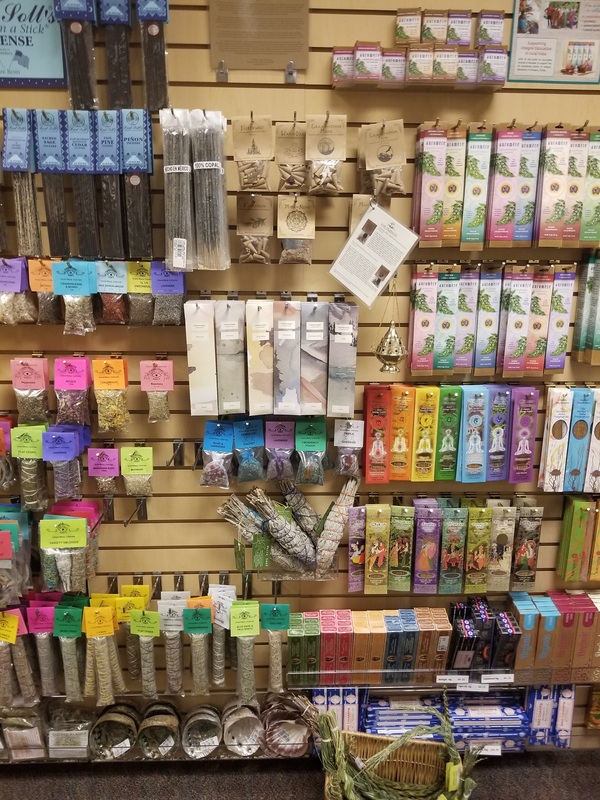 We carry an assortment of different types of Tibetan and Butanese incense. I don’t have a specific brand to recommend as East West doesn't have a huge amount to offer, but you can come in anyway and try them out sometime. 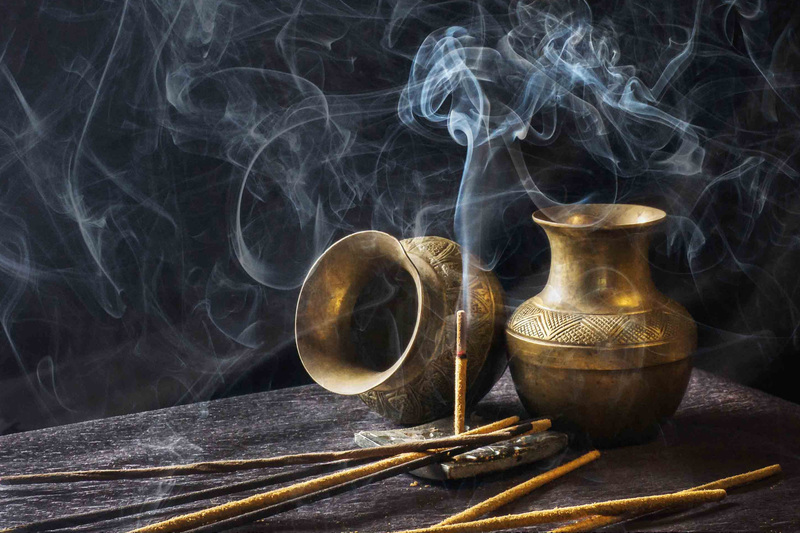 I hope this article has helped open up a new world of incense to you. If you have any questions at all, feel free to post them below and I will do my best to answer them. I also work at East West Bookshop regularly, so stop by and ask for Shae if you want to chat more about incense.